Big Sandy 5/31/13 - - - 9 messages. Showing 1 through 9. Yes, it was the last weekend in May and the main water on Big Sandy has finally seen the high 50s and a few 60s in water temperature. 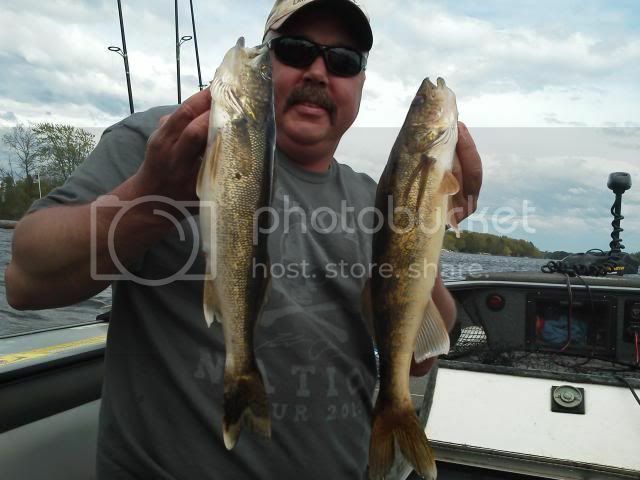 Over the memorial holiday the river systems produced walleye after walleye for the visiting anglers. Of course that sent people headed back to the river system this weekend with big disappointment. The fish are moving back out to the main lake and it spreads the people out more. I had a long time friends son come in from South Dakota on Thursday night so Friday was going to be our fishing day together. Our fishing time ended up being between 11am and 5pm. This is not unusual for Big Sandy due to the stained water. You really want that sunshine to add some flash to your spinners and lures. When I hit my first spot I noticed that there was a 5 Deg temp difference from one side of the point to the other. It only produced small pike and only on the warm side. My second spot was the winner almost immediately. It was on the rough side of the lake which made boat control very difficult but was producing 4-7 walleyes per 150 yard pass. I kept the boat in 4-8 feet of water and we were using Lindy Rigs. Hammered copper and Chartreuse were the winners along with red hooks. We also varied between crawlers and leeches. 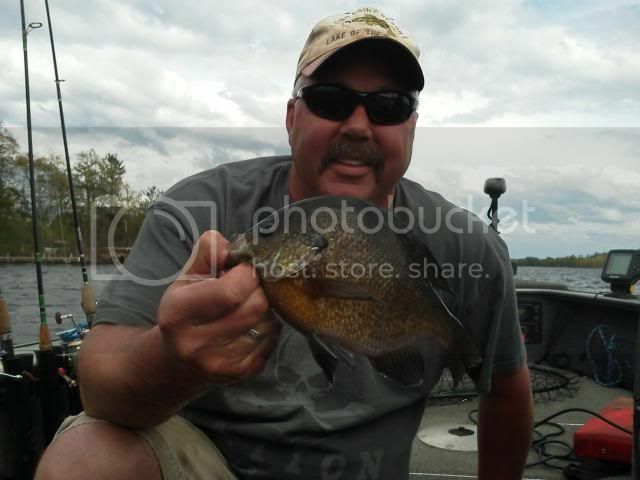 I did spot many others pan fishing and jigging walleyes with minnows. The majority of the fish we caught were in the 12-14 inch range but we boated over 50 walleyes in this outing alone not including multiple northern, crappie and sunfish. Yes all in the same area. It was a fun day to bring a father/son out for a well overdue fishing trip and cant wait to bring them again! Enjoy a couple pics. Thanks for all you contribute, SB! Nice Pics. Real nice sunny! I would take those 12-15 inch eyes in numbers like that over a couple nice ones any day. Are there any good bass in Big Sandy? I only fished it once, the water looked good, but with no results. If there are, can you enlighten me on patterns?? We were back up there again, fishing 6-7 feet deep with bobbers and leaches. Caught about 20 walleyes, 13 of them were keepers. The biggest throw back we had was a very nice 23". Good Bass? Never seen a good pesky bass.... The population is on the rise and can be found in traditional haunts. There are plenty of bays and weed edges to cast into. I have also seen a good boom of small mouth coming in! Yeah... smallies, especially later in the year, can get pretty big out on the rock piles.